Sharepoint–how do I hate thee? 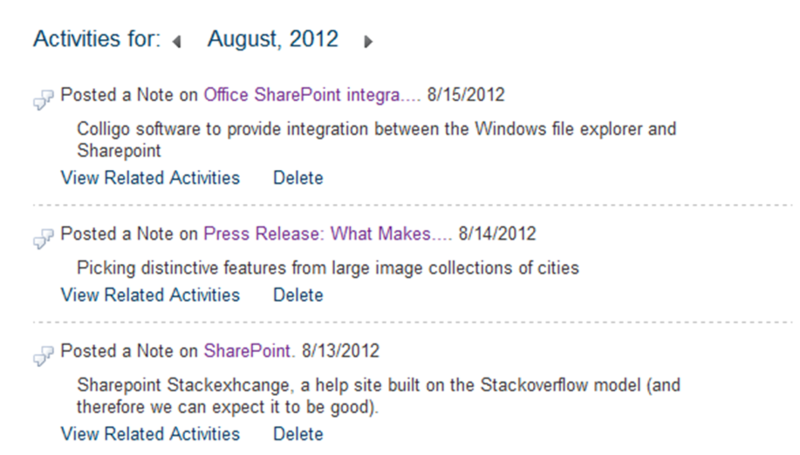 Sharepoint is Microsoft’s document sharing and collaboration tool. It allows you to share and manage documents, and to build websites – so it’s a content management system too. For work I am strapped to the mast of Sharepoint: we need to share files across the world, previously we used shared network drives, as a byproduct individual teams can also create websites. There are close on 100,000 of us. The file sharing/content management schizophrenia can lead to horrible websites, on a normal website you might expect that following a link in a page will take you seamlessly to another web page to be rendered in your browser. Not in Sharepoint: the siren voice of the file sharing side means that all to often website authors are going to link you to documents – so you hit a link and if you’re lucky you get asked whether you want to open a document in Microsoft Office, if you’re unlucky you get asked to enter your credentials first. Either way it breaks your expectation as to what a website should do: hit link – go to another webpage. The problem is that whilst it nominally ticks these boxes it is uniformly awful at implementing them. I’ve used WordPress and Blogger for blogging, phpBB for discussion forums, moinmoin and Project Forum wiki software, source control software, twitter, delicious, bit.ly, Yammer for social media and in comparison Sharepoint’s equivalent is laughable. This ineptitude has spawned a whole industry of companies plugging the gaps. 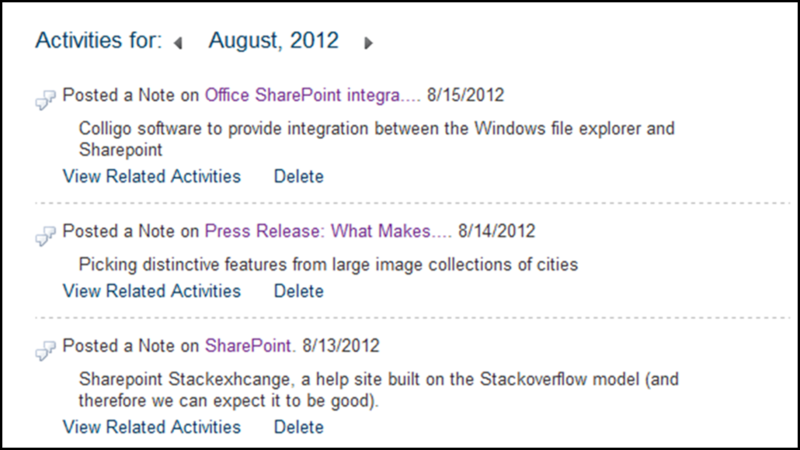 Sharepoint does feature some neat integration into Microsoft Office: viewing shared calendars in Outlook, saving directly to Sharepoint from office application but this facility is a bit flakey – Office will try to auto-populate a "My SharePoint sites" area but does it via a cryptic set of rules which can’t be relied on to give you access to all of your sites. Take this piece of design (shown below), this is part of the new Sharepoint social media facilities but it’s ugly as sin, most of what you see for each Note is Sharepoint boilerplate (Posted a note on – View Related Activities – Delete) rather than your content, furthermore I have repeatedly set my dates to format dd/mm/yyyy in the UK style and this part of my site remains steadfastly on the US mm/dd/yyyy format. Here’s another nasty piece of design.The core of the document sharing facility is the Document Library, below is a default view of one of my libraries (with some blurring). All of the Sharepointy magic for a document is run off a dropdown menu accessed via a small downward pointing triangle on the "Name" field, the little triangle is only visible when you float over that particular line, note also that if you click on the name in the name field then that takes you to the document – so you trigger two different behaviours in one field. Other items in this table are hyperlinks but take you to entirely uninteresting content. It didn’t have to be this way, the Document Library could functionality could have been integrated into the Windows File Explorer. Applications like the source control software TortoiseSVN and TortoiseHG do this, putting little overlays onto file icons and providing functionality via the right click menu. Windows 7 even has a panel at the bottom of the screen which seems to offer quasi-Sharepoint functionality – you can set tags for documents which could map to the "properties" that Sharepoint uses. Users are familiar with the file explorer, Sharepoint discards that familiarity for a new, clunky web-based alternative. Furthermore users sharing files are often moving from a directory-based shared hard-drive scheme, Sharepoint allows you to use directories in Document Libraries but it breaks the property-based view which is arguably a better scheme but forcing users over to it wholesale is unreasonable. In summary: Sharepoint suffers from trying to be a system to share documents and a system for making websites. It features a poor web interface for functionality which could be integrated into the Windows file explorer.